well, that is so sweet I was on her list of favorites. thank you for your comment and your nice words! good luck with your recovery – sending you happy, healing vibes! I add pumpkin too. =) Love the texture it gives and the kids don’t complain! Adding pumpkin is such a great way to add extra vitamins to chili. This looks like the perfect cold weather meal! This sounds amazing! Especially with the addition of pumpkin!! 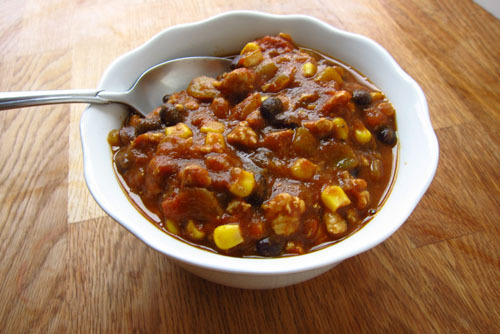 This chili is the perfect warmer for this time of year. Mmmm sounds warming and comforting! I’m sending this one to my sister. She loves to cook and this one is right up her alley. The photo makes me think of curling up by a fire. Gorgeous. I can never get tired of ANY kind of chili! This sounds amazing with pumpkin! I have lots of fresh pumpkins. How would 1 can of canned pumpkin transfer to fresh pumpkin? this article and chart from better home and gardens is great for converting to fresh pumpkin! Thank you for that link, that is very helpful! I know what I will be doing this week. Converting pumpkin to pumpkin puree for the winter! What is the exact portion size. 1/2 cup or 1 cup? Just curious so I can enter it into myfitnesspal. The portion size is one cup. Sorry I forgot to include it. I hope you like the recipe!